When video bloggers Dan Howell and Phil Lester announced that they had recorded an audio version of their book The Amazing Book Is Not On Fire, I was intrigued. I've enjoyed Dan's and Phil's unique senses of humor on their individual YouTube channels, their gaming channel, and their show on BBC Radio 1, and I thought that the audiobook form would lend itself particularly well to their back-and-forth banter. Since I had an Audible credit to spare, I decided to give it a try. The Amazing Book Is Not On Fire is a little under four and a half hours long in audiobook format. The regular price of $25 is a bit steep for that relatively short length, but my purchase price worked out to less than that due to my family's Audible subscription. There's a loose structure to the book, as it begins with stories from Dan's and Phil's childhoods, school years, and university days, then details their YouTube channels and Radio 1 show, and finishes up with slightly zany creative works. A lot of trivia and just-for-fun features are sprinkled throughout each section, regardless of the overall focus. Since the physical copy of The Amazing Book Is Not On Fire is heavy on photographs and artwork, Dan and Phil cope with translating the book from a visual to audio format in a variety of ways. The audiobook comes with a short PDF supplement that contains a few of the image-heavy features, and Dan and Phil describe other images throughout. To make up for the loss of most of the photographs, Dan and Phil enliven their reading with background music familiar to viewers of their videos and aside comments not present in the text. The ad-libbed banter is funny and feels more personal to me than the images would, which is one of the reasons I opted to get the audio rather than the version of The Amazing Book Is Not On Fire. Overall I enjoyed the content of the book, which is a fairly even mix of personal anecdotes, advice, and general silliness similar to what you'd find on Dan and Phil's channels and radio show. While I'm right around Dan's age and younger than Phil, I did sense at times that they were addressing an audience who are predominantly in their early teens. However, as an older listener I did enjoy the features that gave more insight into Dan's and Phil's creative processes and real-life dynamic, like their behind-the-scenes YouTube channel trivia and everyday text conversations. 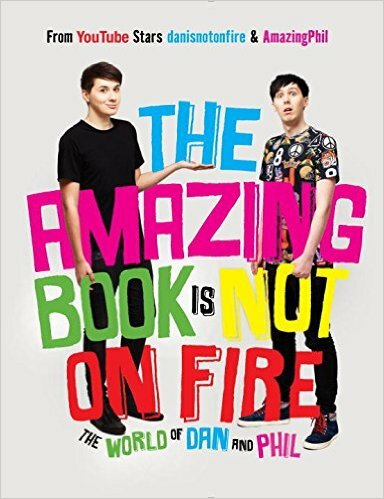 In a nutshell, The Amazing Book Is Not On Fire is an extension of Dan and Phil's work on YouTube and Radio 1, and it's a light and fun listen (or read) for anyone who's enjoyed spending virtual time with these two before.